Is concealer and highlighter the same? Which one to apply first? I have watched a lot of you tube videos but they apply a lot of products that I loose track then. Can you please tell me what should I buy etc. 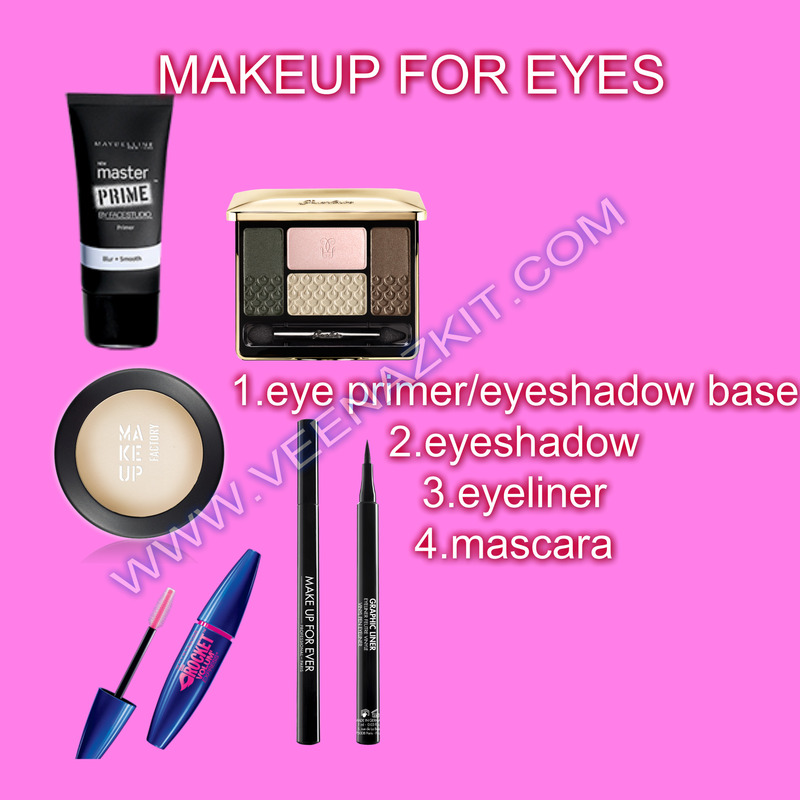 So I have decided to do a series on Make up “How to’s ” and split it into different posts to make it specific. 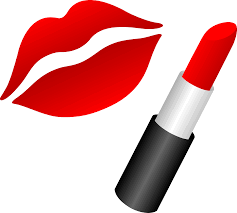 I will be covering everything from steps on how to apply makeup and will suggest products ideal for each skin type. So I’m sharing with you all my foundation routine. Today I’ll be sharing with you all my foundation routine but with a little variation to generalize it. 1. 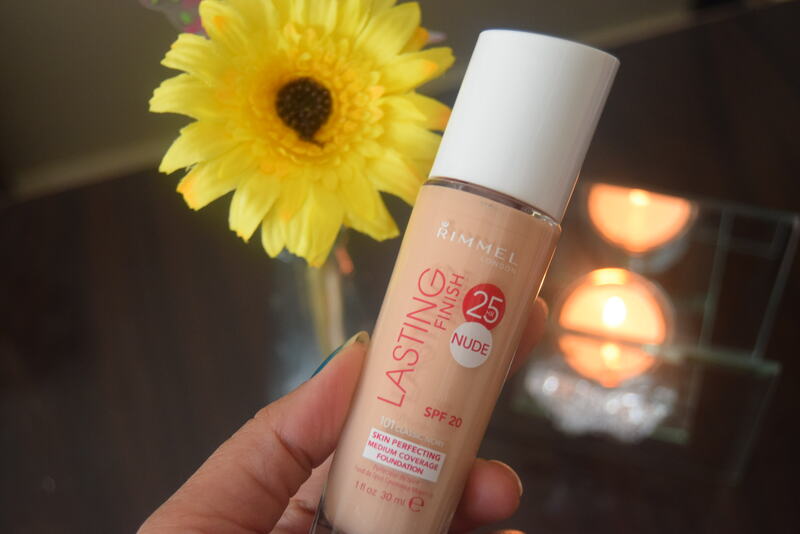 Face Primer (optional)– For me , this is optional as I personally think face primer is one overrated and unnecessary beauty product. Yes, you hear me right. Most of the time my make up routine does not include any face primer because the moisturizer I applied is good enough to work as a primer and holds my makeup for longer time. I’m not saying I don’t own a single primer, I do and that too, a lot! 😛 (I’m just a makeup addict so I need everything LOL). Okay so moving on, Face primer helps makeup to stay long, smooths skin as it covers pores(silicone base ones usually do this job) and prevents natural facial oil from showing up. I have a combination to oily skin, more towards oily and let me tell you, none of the face primers really made THAT difference that I can say “Oh wow, my skin is perfect now” I get the same result even with just moisturizer. It’s really totally up to you. If face primer will give you the confidence, then go ahead use it. After applying the face primer, wait for like a minute then move on to the next step. Suggested Face Primers : Though I’m an advocate of drugstore products, I still will give the option of high-end too as many of you might prefer only pricey ones. 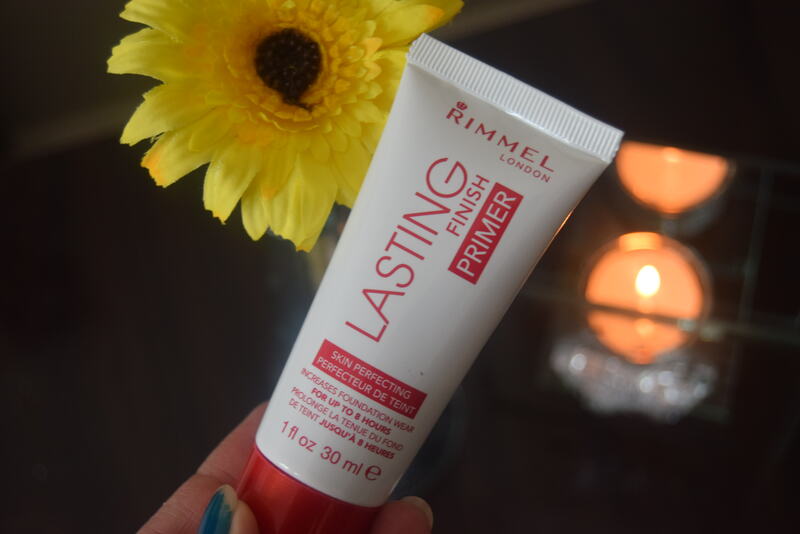 There are plenty of face primers out there offered by every brand but I’ll mention those that I have used. 2. 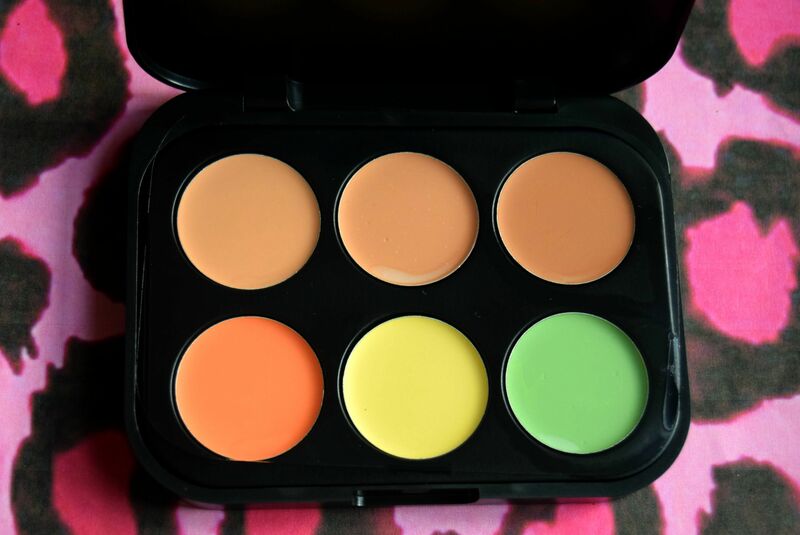 Corrector (optional)- We use color correctors to cover any discoloration in our face , like dark circles, blemishes etc. Correctors do some heavy-duty job with your imperfections. There is a proper color for a certain discoloration you have to get a flawless look. Check this post to know how to cover all those unwanted colors on your skin. 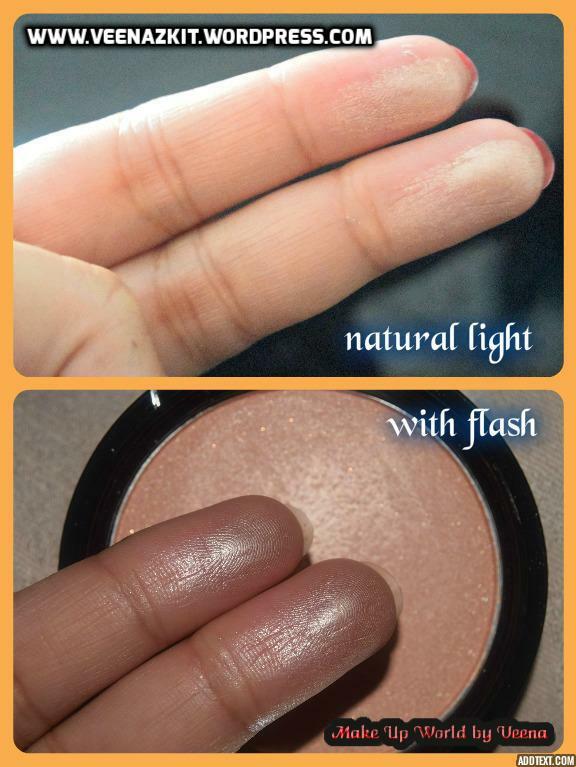 You may apply this using any concealer brush but I prefer using my fingers esp when I’m working under my eyes. 3.Foundation/BB cream- After covering all those colors that make your skin color uneven, it is now time to apply your foundation which you have bought according to your skin type and color(obviously). Normally I just like to grab my BB cream instead of foundation. I’ll go for foundation in case I want more coverage than usual. You may apply foundation using your fingers, makeup brush or beauty blender. For those who do not know what beauty blender is, it is the Holy Sponge everyone has been raving about. You just need to check what suits you more. I use my foundation brush. 4. Concealer- concealer is needed to cover any imperfection that your corrector haven’t really covered. In my case , I do not need any concealer whenever I use the corrector. When I do not use corrector, I usually need some concealer then to get that flawless look. Not unless you have a lot to cover, you will need both. You must be wondering how your face would look with all these products. 😀 Do not worry about that, always apply minimum amount of corrector and concealer to avoid caking up. 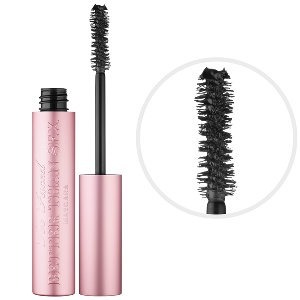 Apply using a concealer brush or fingers and dab gently on areas you need them. Suggested Concealers by me: L.A Girl Pro concealer, e.l.f concealer and highlighter, Maybelline Age rewind, Benefit Fake up, Nars Radiant creamy concealer. 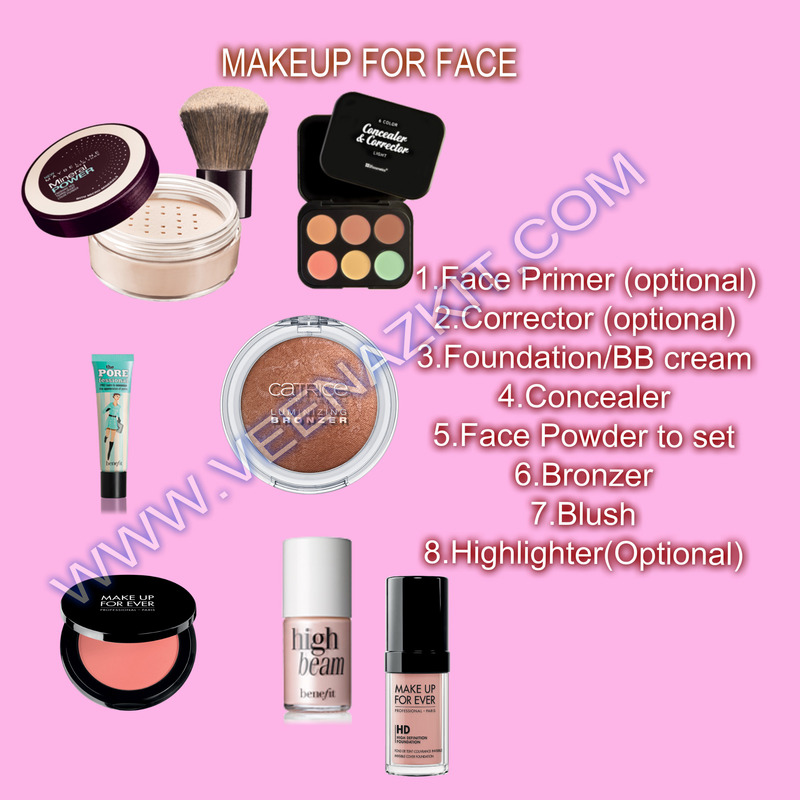 5.Face Powder to set– Face powder is very important as you will need this to set all those products you applied from 1 to 4. Powders can be pressed ones or the loose ones. I always prefer loose powder as I have oily skin but at times I used matte pressed powders too. There are just plenty out there to choose from according to your skin type. 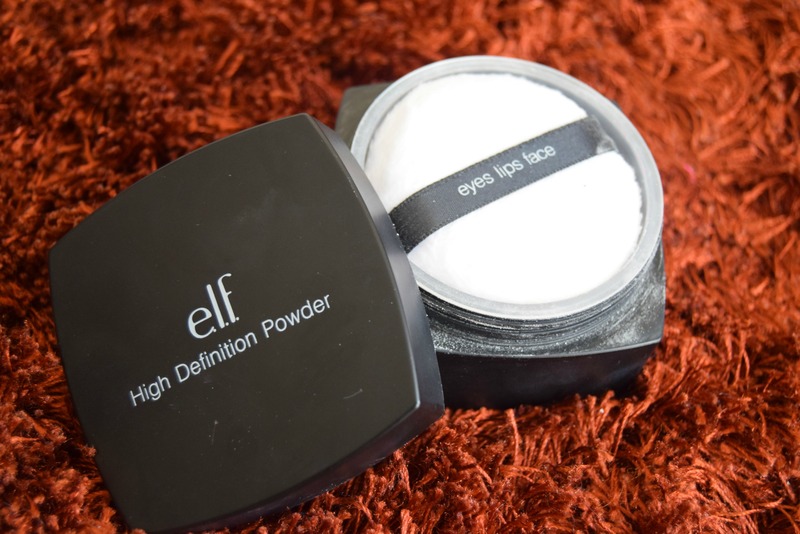 e.l.f HD loose powder, Prestige loose powder, Rimmel Stay matte pressed powder, Bodyshop pressed powder, Make up forever HD Powder. 6. Bronzer (Optional)– This is so optional for me as I am very much happy with how my skin color is after all my make up and I don’t need any kind of “browns” at all. 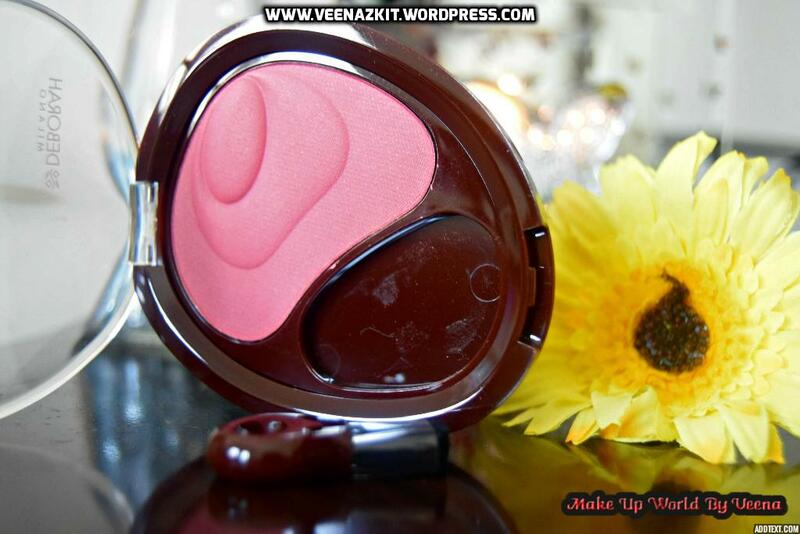 However I need a blush! I use bronzer occasionally when I would want a light contouring. But almost everyone uses that nowadays, so go ahead if you want to be part of the gang. Bronzers, I personally think are for those who are pale if not almost, to add some color to the skin because after applying all the products from steps 1 to 5, one can end up looking so “colorless” & “white” if you know what I mean. 8. Highlighter(Optional)- Again this is optional for me as I have applied makeup tons of times years ago, way before highlighters were even invented and I think I still looked pretty without a highlighter :P. 😉 Just that, with everyone talking about it, you can’t ignore this products specially after what it does to makeup. Highlighter is a product that actually highlights areas of the face that is hit by light like upper cheeks, brow bones, T-Zone, chin and cupid bow. You either highlight using shimmery highlighters or any matte powder 2 shades lighter than your skin. Highlighting is given a very interesting name “strobing” nowadays just so you know if you don’t yet. The highlighters used for strobing are shimmery that will give a subtle shine to all those areas I mentioned above and Illuminators are used for the same purpose of giving your cheeks that extra glow. You must be wondering where is the ‘wonder’ contouring step! Well I just didn’t feel like including it here, as a beginner ,trust me you don’t need that for now. To see what else I’ll be including in this series, check this post. Makeup brushes for beginners here.